Notes: Flown in Westland helicopter from Forces Postal Service, Mill Hill to Westland Heliport at Battersea signed by two of the flight crewe with lots of backstamps - absolutely pristine. 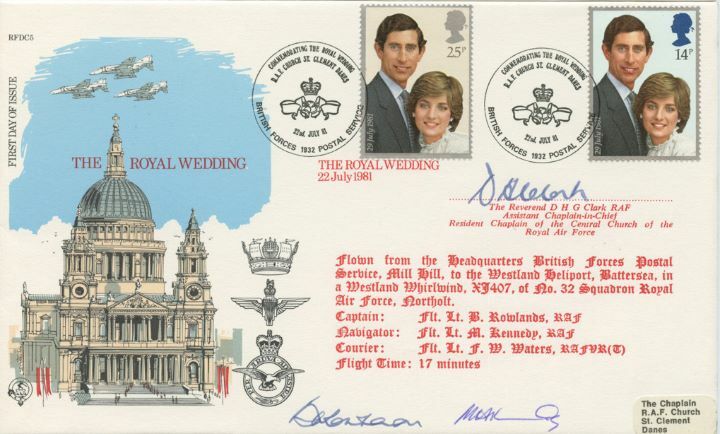 The above Royal Mail Royal Wedding 1981 stamps were issued on 22 July 1981 by Royal Mail and feature the following stamp designs: 14p; 25p Portrait of Charles & Diana. The RAF St. Clement Danes first day cover with the BFPS - Forces, RAF Church St. Clement Danes, Special Handstamp postmark has been produced by Forces and features these stamps which can make a very collectible and lovely gift.